Inheritance is the passage of traits that are genetically determined. Inherited traits are passed from parent to offspring. However, most traits are not strictly determined by genes, but rather are influenced by both genes and environmental factors. A mutation is a change in a DNA sequence that affects a gene. Mutations can result from DNA copying mistakes made during cell division or environmental exposure to things that affect DNA in the body, like radiation, exposure to chemicals called mutagens or infection by viruses. There are two kinds of mutations. Germ-line mutations: Occur during cell division when reproductive cells (eggs and sperm) are being made and can be passed on to offspring. Somatic mutations: Occur to cells that divide in the body throughout one’s life (such as when healing from an injury or regularly replacing blood cells) or from environmental exposure. These kinds of mutations are not passed on from parent to offspring. The exact DNA sequence of an individual is referred to as that person's genotype. The collection of all observable and measurable traits of that individual is the person's phenotype. It is not which genes you have (genotype), but how those genes are expressed and interact with each other during development (phenotype) that makes you different from another individual of the same species. Every disease or health condition has a genetic component. Through molecular biology research we are just beginning to understand the function of suspected disease-related genes and how they work in normal and "at-risk" individuals. Single-gene disorders: Single-gene disorders are caused by DNA changes in one particular gene, and often have predictable inheritance patterns. More than 10,000 human disorders are caused by a mutation in a single gene. Each individual single-gene disorder is very rare, but as a whole, these kinds of disorders affect about one percent of the population. 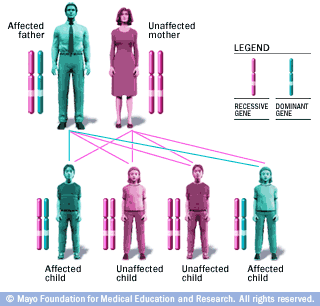 Single-gene disorders can be caused by inheritance of either dominant or recessive genes. The difference is shown below in illustrations developed by Mayo Clinic. Dominant single-gene disorders include Huntington's disease and inherited forms of high cholesterol. Recessive single-gene disorders include cystic fibrosis and sickle cell anemia. Source: Republished with permission from Mayo Clinic, Genetic Testing, 2016 (http://www.mayoclinic.org/tests-procedures/genetic-testing/multimedia/genetic-disorders/sls-20076216?s=3). Complex diseases: For the most part, complex diseases are caused by a combination of genetic, environmental and lifestyle factors, most of which have not yet been identified. The vast majority of diseases fall into this category, including several congenital defects and a number of adult-onset diseases. Some examples include Alzheimer's disease, asthma, multiple sclerosis, osteoporosis, connective tissue diseases and autoimmune diseases. Cancer: Cancer is a group of diseases characterized by uncontrolled cell growth. Cancer is caused by a mutation, or accumulation of several mutations, resulting in a breakdown of the normal regulatory controls that keep cell division in check. These mutations can be inherited, can be caused by errors in DNA replication or can result from exposure to mutagenic viruses or chemicals. A cancerous tumor can spread to other parts of the body and, if left untreated, be fatal.